Saint Louis coach Duane Fraticelli tried to settle his team down yesterday. The Crusaders committed five errors. On the heels of a grueling California road trip and four Interscholastic League of Honolulu games in the past eight days, the Iolani baseball team is drained. But, the No. 3 Raiders mustered enough energy to score two runs in the bottom of the seventh inning and steal a 9-8 victory away from a No. 9 Saint Louis squad that committed five errors -- all of which resulted in runs. 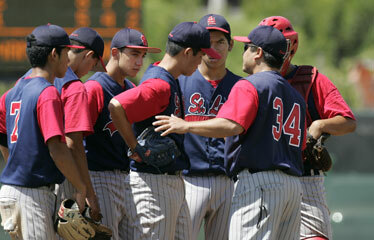 The Raiders (16-10, 5-2 ILH) came away victorious in yesterday morning's ILH duel despite a shaky effort on the mound. Three Iolani pitchers combined to walk eight batters, and starter JR Bunda plunked two more. However, reliever Jon Okada held the Crusaders (11-8, 1-6) scoreless in the game's final 2 1/3 innings, and allowed his team to chip away at the 8-4 deficit he inherited. "Our game is to put pressure on the other team, not to come out and score nine runs" said Raiders head coach Dean Yonamine. "Give Saint Louis credit, they put the ball in play and put pressure on our defense. We didn't make enough plays in key situations and we got ourselves into that hole. But we kept in there, stayed positive and kept battling. That was big, because when you get to three (league) losses at this point, you're out (of the championship picture) for the regular season I would think." After the Raiders picked up a run in the fifth inning to narrow the gap, third baseman Case Miyahira started off the sixth inning with a stand-up triple. Reyn Nagamine then launched a home run over the scoreboard in right field to cut the deficit to 8-7, and energize his teammates, who were playing their second game in less than 18 hours after defeating Pac-Five 14-4 on Friday. Kela Marciel kept the clutch hits coming, and opened the seventh with a triple off Crusader reliever Joshua DeMello. After Daniel Takami was hit, Rylan Morihara attempted to move him over to second with a sacrifice bunt. The bunt was executed perfectly to the right side of the infield, and forced Saint Louis second baseman Lucas Gonsalves to rotate over and take the throw at first. But, he dropped the ball, and the miscue allowed Marciel to trot home, tying the game at 8-8 while runners stood at first and second with no outs. Miyahira finally ended the nearly 3-hour-long battle with his third hit of the day, and the senior's single to right field plated Takami, who had to run over catcher John Haina on his way to the plate. "Easily, we shoulda blown these guys out, but the problem right now is our mental (state)," said an understandably frustrated Crusader head coach Duane Fraticelli. "We had good practices this week, and we told (our players), 'Don't worry about the first half of the season.' But five errors will kill any team; you can't win with errors." Lost in the drama of Iolani's comeback was the performance of Saint Louis starter Jayson Fukumoto. The senior turned in a strong five innings on the mound, and only four of the seven runs he allowed were earned. Fukumoto helped his cause at the dish with four RBIs on three singles. "Fukumoto pitched a helluva game, but had no support on defense," Fraticelli said. "We practice and preach that every day -- defense is what's gonna win championships. We had all the opportunities, and (had 11) runners left on base, so we've got to work on these guys' minds and teach them the mental part of the game. The talent is there, we can play with anybody in the state. But we're beating ourselves every single game, and that's what's hurting us right now." Jayson Fukumoto, Kyle Gonzaga (6), Joshua DeMello (7) and John Haina. JR Bunda, Sheldon Lee (4), Jon Okada (5) and Grant Iwamoto. W--Okada. L--DeMello. Leading hitters--StL: Fukumoto 3-4, 4 RBIs; Haina 2 RBIs; Daniel Higa 2 3bs, 4 runs. Iol: Case Miyahira 2b, 3b, 3 RBIs; Reyn Nagamine Home run, 2 RBIs; Brennan Nacario 2 RBIs. Duncan Ebert had four strikeouts to help the Monarchs score an upset of the Owls. In the bottom of the seventh inning, Mid-Pacific's Todd Nagamine -- representing the tying run -- hit a single to right field, then advanced to second base on an out. But the Owls' last batter struck out and Damien held on. Duncan Ebert and Darby Ventura. Dane Kinoshita, Matthew McDaniel (7) and Aaron Fujiki. W--Ebert. L--Kinoshita. Leading hitters--Dam: Travis Derby 2-4; Ventura 2b; Brennan Alejo 2b. MPI: Fujii 2-3, 2b; Derek Tam 2b; Todd Nagamine 2-3. Ashkhon Kuhaulua hit a two-RBI single in the bottom of the sixth to spark a five-run inning and help avoid the upset from the winless Wolfpack, who threatened with a 8-7 edge late. Kuhaulua went 3-for-3 with three RBIs. Ian Padaken, Ryan DeMello (6) and Reid Morihara. Kapono Chang, Alika Pruett (5), John Worthington (5), Ashkhon Kuhaulua (7) and Vance Nobriga, Les Akeo (6). W--Worthington. L--Padaken. Leading hitters--P5: Kama Moises 3-4, 2 RBIs; Padaken 2 RBIs; Jon Ray Rodrigues 4-4; Morihara 3-4. KS: Keoni Lum 2-3; Waylen Sing-Chow 2-3, 2b, 2 RBIs; Mitch Kauweloa 2-4; Worthington 2b; Parker McCready 2 RBI; Kuhaulua 3-3, 3 RBIs. Knights pitchers Pulama Silva and Joshua Serrano combined for what would be the game-winnng run in the top of the seventh inning over the Tigers. Serrano hit a leadoff triple, and Silva -- who also picked up the win -- singled him home. Joshua Serrano, Pulama Silva (5) and Lyle Kitagawa. Michael Estes, Roger Kraemer (6) and Kelsen Ganeku. W--Silva. L--Kraemer. Leading hitters--Cast: Silva 2-3, 2b, 3b; Kainoa Tom 2-2. McK: Estes 2-3; Raymond Carey 2b; Kraemer 2b. Kalani 12, Kaimuki 0, 6 inn. The Falcons' Shamus Kumashiro pitched a two-hitter with 12 strikeouts en route to shutting out the Bulldogs. Jason Hopper broke up Kumashiro's perfect-game bid with a two-out single in the fourth inning. Kalani sent 13 batters to the plate in the sixth inning and scored nine runs on three hits. The Bulldogs committed four errors in the game. Shamus Kumashiro and Jason Lee. Masashi Kimura, Ian Delizo (6) and Daren Muramoto. W--Kumashiro. L--Kimura. Leading hitters--Kaln: Wataru Noguchi 2 runs; Ridge Carpenter 2b, 2 RBIs, 2 runs; Lee 2-3, 2 runs; Tyler Matsuda 2b, 2 RBIs. Kili Vierra hurled eight strikeouts in a three-hitter to push the undefeated Surfriders past the Mustangs. Zach Akamine blasted a solo home run for Kailua. Kili Vierra and Ricah Yokoi. Talon Wemple, Kyle Okumura (5) and Richard Preza-Haynes. W--Vierra. L--Wemple. Leading hitters--Kail: Zach Akamine 2-4, HR, 2 runs; Kale Sumner 2-4, 2b, 2 RBIs; Keenan Tanaka 2-3, 3b; Ryan Kinoshita 2-4, 3b, 2 runs, 2 RBIs; Jared Iha 2-4. Moanalua 23, Farrington 2, 5 inn. Sean Amorozo, Keith Kunitake and Kainoa Kaulukukui combined to hold the Governors to two hits. Na Menehune gave up no earned runs in the win. Jordan Monico, Devin Nakama, Chris Liu-Saguid and Ethan Isobe combined for nine RBIs for Moanalua. Sean Amorozo, Keith Kunitake (3), Kainoa Kaulukukui (5) and Chris Liu-Saguid. Brysn Segundo, Diamond Pedro (5) and Paul Manligot. W--Amorozo. L--Segundo. Leading hitters--Moan: Kekoa Lee 2b; Jordan Monico 2-2, 2b, 2 RBIs; Devin Nakama 2 2b, 2 RBIs; Liu-Saguid 2b, 2 RBIs; Ethan Isobe 2b, 3 RBIs, 3 runs. Farr: Manligot 2b. The Seariders' Aina Kalaoa-Meyer had eight strikeouts in a six-hit effort against the Marauders. Will Duseigneur collected three hits and three RBIs for Waianae. Aina Kalaoa-Meyer and R.J. Tacgere-Bailey, Nalu Haohio (6). Triton Gante, Kaimi Haina (6) and Haina, Samuel Chee (6). W--Kalaoa-Meyer. L--Gante. Leading hitters--Waian: Ben McQuown 2-3, 2b, 2 RBIs; Will Duseigneur 3-4, 2b, 3 RBIs. Waip: Haina 2-3; Eric Hudson 2b. No. 4 Pearl City 21, Nanakuli 0, 5 inn. After the Golden Hawks' leadoff hitter singled off Cory Yuh in the first inning, Nanakuli went hitless the rest of the way against the Chargers. Yuh struck out 10 batters in the five-inning game. Ryne Acosta drove in four runs and catcher Jeff Domingo went 4-for-4 with a double, triple and three RBIs. Cory Yuh and Jeff Domingo. Isaiah Tanaka and Lalo Respicio. W--Yuh. L--Tanaka. Leading hitters--PC: Rory Nakayama 2-3, 2 RBIs; Ryne Acosta 3-5, 4 RBIs; Domingo 4-4, 2b, 3b, 3 RBIs. No. 6 Mililani 14, Kapolei 2, 6 inn. The Trojans remained undefeated in the OIA West behind a three-hitter from Richie Mariano. Kelen Cadian, Travis Jones and John Abreu drove in two runs apiece for Mililani. Richie Mariano and Casey Miyasato. Rhennon Tierra, Michael Sanchez (3), Lyle Santiago (4) and Kalani Omoto. W--Mariano. L--Tierra. Leading hitters--Mili: Kelen Cadian 2 RBIs, 2 runs; Travis Jones 2-4, 2 2b, 2 RBIs, 2 runs; John Abreu 2-4, 2b, 3b, 2 RBIs; Dustin Antolin 2-4. Kap: Tierra 2 RBIs. Leilehua 10, Radford 0, 5 inn. The Mules put the game away in the fourth inning, highlighted by Ehukai Woolley's two-RBI double. Leilehua reliever Darren Baccay struck out the side in the fifth inning to close the door. Desmond Ontai, Jayson Cabalce (4), Darren Baccay (5) and Cabalce, Ehukai Woolley (4). Brad Osborne, Nick Navarro (4) and Zack Seitz. W--Ontai. L--Osborne. Leading hitters--Lei: Edieson Dunlao 3-4, 2b, 3 runs; Baccay 2 runs; Ontai 2 RBIs; Woolley 2b, 2 RBIs; Bryce Tarter 3b. Aiea 16, Waialua 2, 5 inn. Randy Castillo fanned seven batters and combined with two other pitchers for a three-hitter of the Bulldogs. Castillo hit a grand slam, Kanekoa Asing added a three-run shot and Ryan Murakami hit a solo blast in Na Alii's rout. Randy Castillo, Noel Amoroso (4), Blane Higa (5) and Anthony Tsui, Brenan Sato (3). Shayne Peiler, Bryce Whittaker (2), Arthur Hernandez (4) and Kekoa Ford-Parrish, Sebastian Bajo (4). W--Castillo. L--Peiler. Leading hitters--Aiea: Castillo grand slam, 4 RBIs, Kanekoa Asing 2-2, 3-run HR, 4 RBIs; Keenon Naeole 2-3 2 RBIs; Ryan Murakami 3-3, 2b, HR, 3 RBIs. Waia: Bajo 2 RBIs.